MORGANTOWN, W.Va. – The WVU Heart and Vascular Institute’s Center for Esophageal Disease is offering a new treatment for patients with achalasia, a disorder that causes the esophagus to spasm and prevent proper swallowing. The peroral endoscopic myotomy (POEM) procedure provides a minimally invasive way to treat the condition. 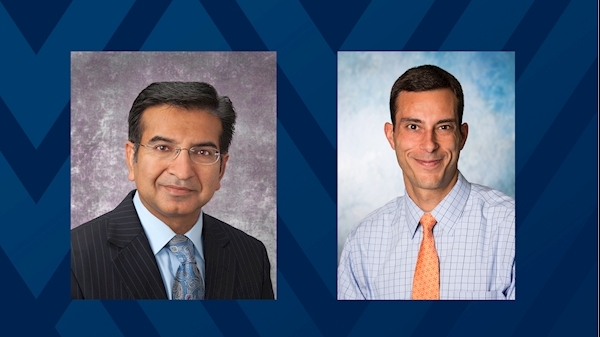 Ghulam Abbas, M.D., and Justin Kupec, M.D. The procedure allows surgeons to perform a myotomy, or cutting of the muscular walls of the esophagus, endoscopically through the mouth instead of robotically through the abdomen. Because the procedure does not require access through the muscles of the abdomen, patients have a much shorter recovery and are generally able to go home the same day. The WVU Heart and Vascular Institute is the first provider in the state to offer this minimally invasive procedure.